#204: When the Brakes Fail | mark Joseph "young"
This is mark Joseph “young” blog entry #204, on the subject of When the Brakes Fail. It happens all the time in movies and television shows: someone is driving, and someone has sabotaged the car so that the brakes don’t work, and frequently, too, the accelerator gets stuck so that the car is now out of control and headed for a major accident. I have seen it enough times that what bothers me is the number of ways of slowing or stopping a car that they don’t try. I have not been in the kind of situation portrayed in these fictions, but I have had brake trouble and have given thought to how to address the kinds of problems so portrayed. Maybe if those people had considered the possible solutions to the problems before they happened, they would have avoided the life-threatening accident–and perhaps if we talk about the options, you will know what to do if it happens to you. First, let’s get a few assumptions here. First, it is unlikely that you will completely lose your brakes without warning, and similarly unlikely that your accelerator will jam; it is thus unlikely, barring sabotage, that both will ever happen at the same time. Second, you are very unlikely to be the sort of person whom someone would attempt to kill by sabotaging your car. That’s not to say that no reader of mine is such a person, but it’s a very unlikely sort of way to try to kill someone, and a very small percentage of the population are actually targets of killers, and even fewer of careful conniving killers with clever assassination plans and the mechanical knowledge to so rig a vehicle. So you should probably assume that if either of these problems ever occurs to you, it is random mechanical failure, not an assassination attempt (don’t be paranoid, and don’t panic). If both happen together, that’s a different matter, but let’s start with the assumption that only one happens. Brakes once failed when they got wet. Modern brakes generally don’t. 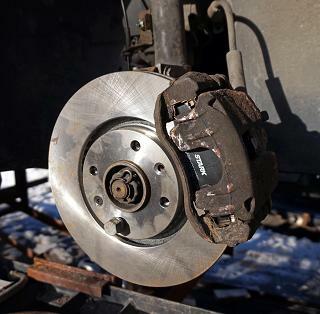 However, the regular driving brake on most vehicles is hydraulic (except for large trucks, which use pneumatic brakes because they work better with the trailers). That means that there is a fluid, a hydraulic oil, in the lines, and pressing the brake pedal compresses the fluid which closes the brake pad creating the friction which slows the car. Modern anti-lock brakes have a sensing system to prevent wheel lock skidding, but otherwise work much the same. If air gets in the line, as from a leak, this can malfunction. For both of these conditions, wet brakes and air in the lines, the first line of defense is to “pump the brakes”, that is, to press and release repeatedly over perhaps ten to fifteen seconds. This will help dry wet brakes; it will help compress the fluid in hydraulic lines forcing the air out of the system otherwise. If within ten seconds this is not showing any sign of improvement, the obvious second line of defense which is almost never used in the movies is what is properly called the parking brake but often identified as the emergency brake and in some vehicles the hand brake. In cars with a center console it is frequently there as a lever that can be pulled up; in other cars, it is often a pedal by the driver’s door. In both cases the control is ratcheted so that when pulled or pushed it locks into place until the release is pressed or pulled or otherwise activated. The proper intended use of this brake is to lock the car in place when parked, particularly on slopes. However, it serves as a secondary brake in an emergency situation. It uses the same brake pads as the hydraulic brakes (although frequently only the rear brakes), but is connected to them by a cable, not a hydraulic system, and so is effectively a secondary but more direct method of applying the brakes. There are other ways to slow a vehicle if the brakes are not working, but first we should consider the problem of the accelerator jamming. The problem here is generally that the engine is being given gasoline and so increasing in revolutions per minute (RPM on the tachometer if you have one), and correspondingly increasing the vehicle speed. The obvious first answer to this, in addition to applying the brakes, is gently to drop the transmission into neutral. (With a standard transmission this can be accomplished simply by depressing the clutch, but standard transmissions are no longer standard on most cars.) The engine will roar as it no longer has the burden of pushing the vehicle, but you will cease accelerating and unless you are pointed down a steep slope you will begin to decelerate. The transmission can also be used to slow the car if the brakes are not responding, by downshifting. If you do this at too high a velocity, you are likely to destroy your transmission and/or damage your engine, but if it’s a choice between thousands of dollars of damage to the vehicle and a fatal crash, that’s probably not a difficult choice to make. This is less likely to be helpful if your accelerator is stuck, but it is an option that might reduce your rate of acceleration. The objective is to let the engine be a drag on the velocity, although it works considerably better with manual transmissions than with automatic ones. If you have put the vehicle in neutral but the brakes are not working and you are headed down a slope, if possible consider getting off the road. Roads are generally designed to be smooth and provide the right kind of friction for rolling vehicles. Shoulders are usually rougher and will slow the vehicle more, and if the ground beyond the shoulder looks flat and level it will probably slow the vehicle more. There is the danger of hitting a hole that will damage an axle, but this will at least stop the vehicle and cost considerably less than a transmission or an engine. You might also consider aiming for objects that will slow your car but neither stop it completely nor flip it. Hitting a tree at high velocity is a bad choice, but a bush will collapse under the impact and slow or possibly stop the car less abruptly. Sideswiping a tree, if you can control the vehicle well enough to do so, will also slow the car. New Jersey Dividers–those perhaps three foot tall concrete walls with the half-parabola curved sides that often line highways–are designed to slow a vehicle and press it back into the lane from which it is coming. In recent years, large usually orange plastic barrels have been placed in hazard locations along highways, such as construction areas; these are generally filled with water, and as such are designed to collapse when hit, providing a less than solid impact surface. One other method of slowing an out-of-control car should be mentioned: shut off the ignition. If the car is in gear, the engine will immediately become a drag on the car, and in most modern cars the fuel pump will stop providing gasoline to the cylinders. If you have power steering, it will immediately become much more difficult–but not impossible–to control the direction of the vehicle, somewhat worse than standard manual steering. It will not affect the parking/emergency brake, and will have only minimal effect on the operating brake. I have also considered the option of pushing the vehicle into reverse or park. This requires overriding safeties on the transmission (it will require you to press or maneuver something to shift out of neutral in that direction), and will probably destroy it and damage the engine, but again if you are worried about dying versus destroying your car, that’s an easy choice. So now if the thing that probably never will happen to you does, you’ve got some ideas about how to handle it. I would like to say that I have tested them, but I am more pleased to say that apart from pumping the brakes I have never needed to, although I have tested the idea of pushing the car into neutral while driving, so that also works. Oh, and once when I was teaching someone how to drive I had to use the parking brake to stop the vehicle before he drove in front of a rapidly oncoming car at an intersection, so that works, too.